Boglioli is one of those classic, premium Italian brands that’s been run by the same family for generations, guaranteeing that the closely guarded secrets and traditions of Italian tailoring survive well into the future. Well, at least that’s part of the story. Long known for the excellence of its soft sports jackets, Boglioli certainly boasts an illustrious history. Indeed, the brand can make a convincing claim to be a genuine high-end Italian menswear company – certainly much more than can, say, Massimo Dutti. But the story is actually a lot messier than this, and the comparison with the aforementioned Italian-named, Zara-owned, label is by no means coincidental. Until recently, the Boglioli family still helmed the company they first formed way back at the start of the last century – albeit with their stake in the business reduced to 30%. But facing severe economic difficulty in 2012, the Bogliolis sold out their last shares, meaning that full ownership passed to Wise, the private equity fund that had been managing the remaining 70% of Boglioli since 2007. Then in early 2017, after a major relaunch failed to propel the brand back into the black, Wise cut their losses and offloaded the entire company to its present owners, Spanish private equity firm PHI Industrial. Let’s just say that this convoluted tale of struggling finances and strategic acquisitions doesn’t bode well for a company that began as a small-town family tailor and went on to build it’s reputation as a niche brand offering fine craftsmanship. I can just imagine the scene in the boardroom as a team of hotshot consultants present their recommendations to Boglioli’s new corporate owners: axe quality, go offshore, or die. And yet, contrary to expectations, Boglioli is still producing in Italy. What’s more, the caliber of products seems to have remained fully up to par. Let’s take a closer look. 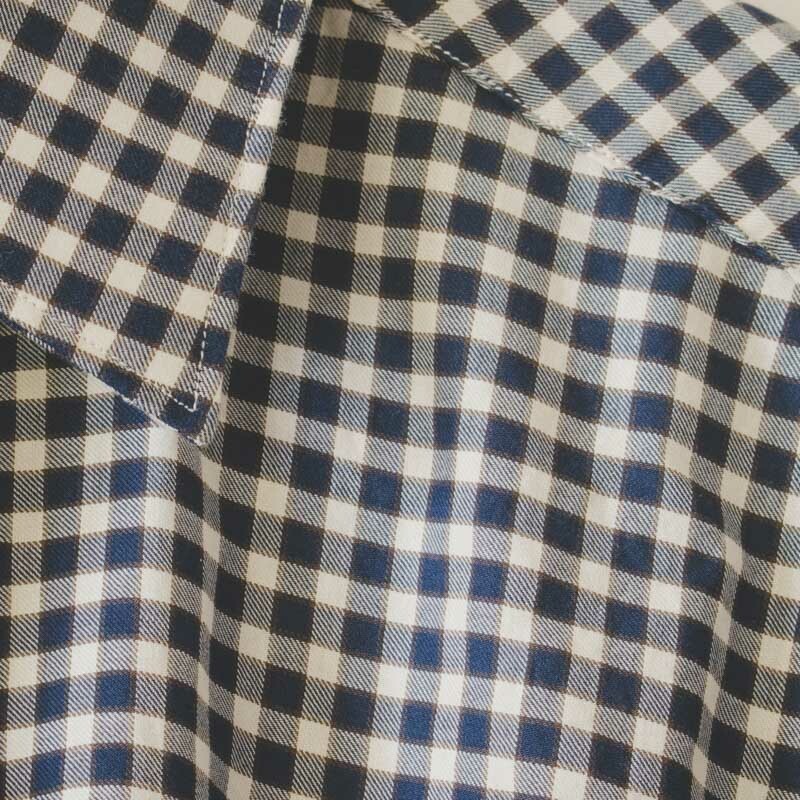 Pictured above is a lightweight checked shirt in a deep shade of blue and a creamy white – with a subtle touch of red in the weave adding an extra degree of interest to the otherwise fairly standard gingham checked cloth. The shirt features a classic, non-button collar, and is without pockets. I’ve seen one or two internet “style gurus” suggest that the cloth a dress shirt is cut from lies way down the list of factors contributing to a high quality garment. I can only imagine that this is because anyone commenting on the design, construction, and manufacturing of a good quality dress shirt takes it for granted that the reader will not be bringing their tailor a bolt of “premium” high-itch polyester shirting to work with. Or, to put it another way, no one would go to the trouble of doing all the other things that contribute to a high quality shirt (split yoke, dense stitching, mother of pearl buttons etc.) if they’re just going to cut the thing from some cheap old rag in the end anyway. Still, I find the suggestion rather odd: surely the fabric a shirt is made from is the most important factor to consider. If it’s going to be sitting next to my skin all day long, it needs to feel damn good to the touch. This Boglioli shirt only serves to confirm that theory for me. So nice is the cloth that quite frankly it could be cut like a sack of rocks and I wouldn’t care much: it would still hang and move great, and feel beautiful against the skin. It’s truly a pleasure to wear. As it happens though, this is also a really nicely cut shirt. In fact, I’d go as far as to say that it’s the best fitting shirt in my closet beyond those which were specifically cut for my body by a tailor. Maybe I just got lucky here, and clearly this would not be the case for every wearer: I’m skinny as hell and so the billowing sails that pass for dress shirts from most off-the-peg brands usually need to be taken in if they aren’t to look ridiculous on me. But anyone with more bulk to accommodate will need to size up if a Boglioli shirt is going to fit them well. The fifteen-and-a-half-inch neck is if anything slightly loose, and yet the rest of the shirt covers my wiry frame very snugly. In shirtmaking, it’s pretty much standard that the buttonholes on the collarband and at the bottom of the placket are cut horizontally, rather than vertically like the rest of the buttonholes. This provides a little “give” in these important areas, while also being more resistant to horizontal pull. However, something I hadn’t previously encountered before purchasing this Boglioli dress shirt was diagonal buttonholes. Googling didn’t provide me with a particularly convincing explanation as to why you would want a diagonal buttonhole at the collar (on the contrary, it seemed to present more evidence as to why you probably would not want such a thing). And my tailor was none the wiser either. However there clearly must be some advantage to this in Boglioli’s mind, otherwise presumably they would have been quite happy to have saved themselves the extra effort. For those paying attention, the shirt also offers a few other subtle touches that are a little out of the ordinary – providing evidence that Boglioli’s new owners are still putting attention to detail high on their list of priorities. For example, the yoke is so slim as to be virtually nonexistent, and moderately eccentric pleats on the sleeves also add a degree of sophistication to the design. 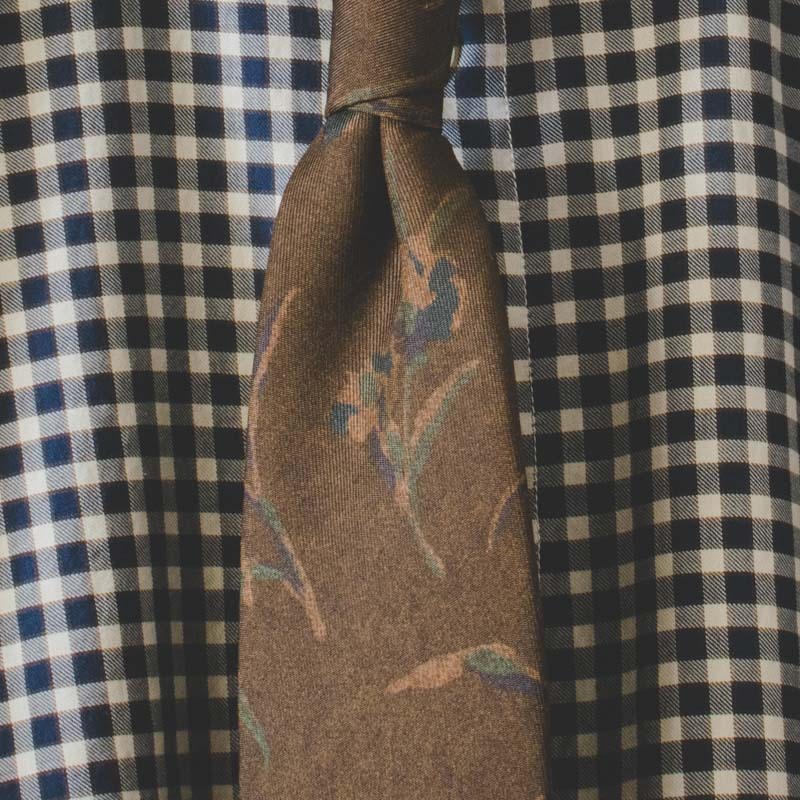 This is a lightweight fine silk tie of medium width, featuring a floral design. The more silk is processed, the more flexible it tends to become. Hence cheaper ties are often more rigid. This doesn’t necessarily mean that a “cruder” silk is inferior to one that has been more elaborately worked upon. To a certain extent the stiffness of a tie is a question of subjective choice. Nonetheless, if you ever craved for a tie that feels a little less bulky and unforgiving around your neck, Boglioli offers an appealing solution: this is delicate silk neckwear that would fly away on the gentlest of evening breezes and won’t leave you tugging at your collar for air on a blazing summer’s day. To be sure, with its botanical motif and chocolate brown ’70s tones, this particular number will not be to everyone’s liking. But Boglioli of course offers a wide range of ties, so there’s likely to be something for most tastes: from the fully retro and outlandish to much more sober design territory. Despite Boglioli having long lost it’s family-brand status and become just another tradeable asset in the cut-throat game of global capitalism, somehow the label is still putting out quality garments. Personally I’ve never been a massive fan of their distinctly Italian line of unstructured jackets dyed in garish primaries, but there are still real gems to be found among their shirts and ties: beautiful soft, lightweight tailoring for the summer months.